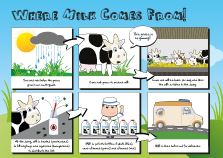 How does a cow produce milk? A dairy cow needs to give birth to a calf in order to produce milk. This chart represents a one year period. The 'dry' period is similar to an adult going on maternity leave, where the cow will rest and prepare for the birth of her calf. Calcium is important for bones and teeth. Dairy foods. are the primary provider of calcium in the UK diet. Calcium can also be found in other foods, so overall it is important to eat a healthy balanced diet. During the teenage years calcium demands are higher than in any other stage of life. Bones develop quickly, as they grow in length and density. During these years it is important to consume foods rich in calcium whilst the body completes the deposition of skeletal mass. Around 80% of the skeleton has been completed by the age of 18 years. Having a good diet provides young people with healthy bones for later in adult life. However, the latest National Diet and Nutrition Survey (NDNS) shows that many teenagers fall short of the recommended calcium intake.